We have a complete lineup of new and used cars for the Rutland, Middlebury, VT and West Lebanon, NH, region, and our customer care continues long after you buy or lease a Audi - thanks to our dedicated car service and auto repair team. Audi Rutland makes the process of securing your next Audi easy. Stop in and see what makes us different! What makes the new 2018-2019 Audi inventory at Audi Rutland so special? To be honest, it's not just the models themselves (i.e., the Audi A4, A5, Q5 and Q7) and all of the safety-, convenience-, comfort-, and connectivity- features they offer. Rather it's the two pillars on which Audi have built their names: integrity and reliability. In a nutshell, that's what initially drives people to 176 US 7 Rutland, Vermont, and part of what keeps them coming back the next time they're in the market for a new car. The same reasons drivers in Rutland, Middlebury, VT and West Lebanon, NH, choose Audi Rutland when they're in the market for a new Audi holds true for consumers in the market for a used car. That's right. Our fun-to-drive, feature-packed used vehicles promise sustained peak performance. For what may be the first time ever, you'll be overwhelmed by a used car lot. That is, of course, unless you've already been here. While our assortment of new and used vehicles may be overwhelming (and we mean that in good way), the financing part is easy as pie at Audi Rutland. This means the fun of choosing your new set of Audi wheels isn't diluted by the stress and/or headache of figuring out terms and conditions. Not only will we do the negotiating for you and get a car loan or lease at optimum rates. We'll explain everything in everyday lingo so that there is no confusion as to what you're signing on for and you realize just how good a deal we got you. 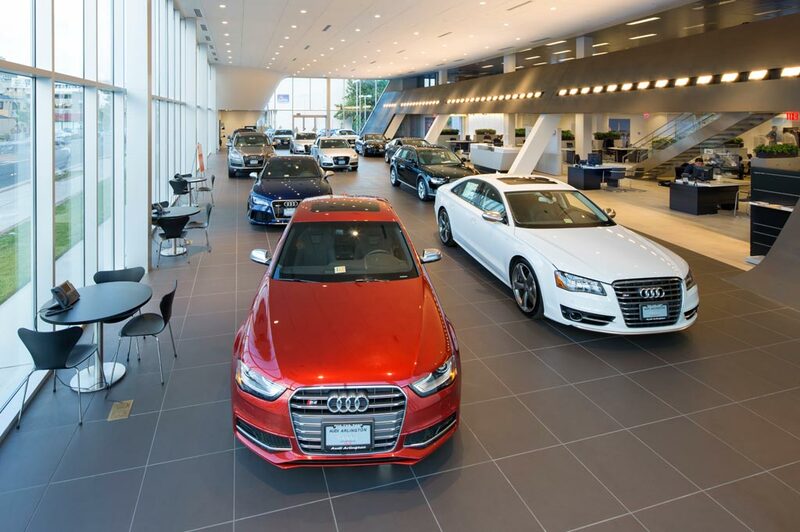 When you take your Audi to Audi Rutland in Rutland, Vermont for auto service, you can rest assured knowing your vehicle is in the hands of highly-skilled technicians. Working with Audi autos every day isn't just what our auto service and repair team does. It isn't just something we're good at. It's our love...which means we have as much invested in maintaining, and when necessary repairing, your car as you do. And, if you decide you want to do it yourself, we'll happily provide you with any manufacturer certified parts you might need - from oil filers to batteries to tires. Among the many services Audi Rutland routinely performs are wheel repairs, auto glass repairs, muffler repairs, transmission repairs, tire rotations, oil changes, belt inspections and more. Feel free to contact Audi Rutland today if you have any questions or if you'd like to schedule a service appointment now. We look forward to meeting you soon and serving you for many more years to come.